Blogposts » Turkey’s Economy – to Boom or Not to Boom? Turkey's Economy – to Boom or Not to Boom? The GED team has addressed the Turkish economy more frequently in recent months (See here and here). The figures on growth for the third quarter of 2017, as published in November 2017, suggest a major boom. But is this growth sustainable? There is reason to doubt. In order to better assess Turkish economic growth, it should be compared with other European emerging and developing economies. The International Monetary Fund (IMF) lists a total of twelve such countries. To make the comparison simpler, I have limited my discussion here to Poland, Hungary and Bulgaria. 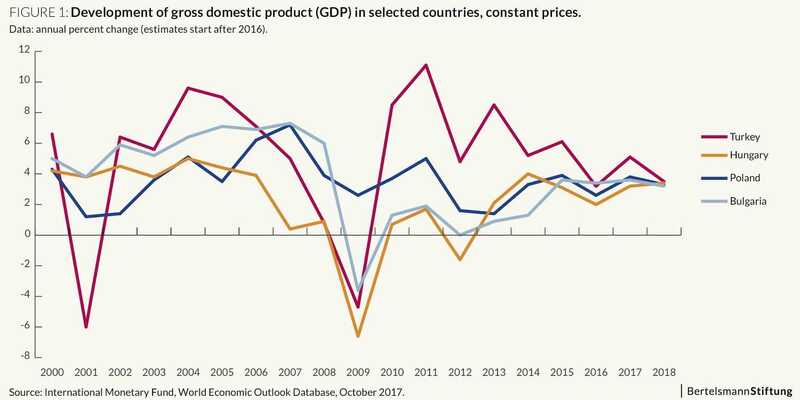 This comparison shows: Turkish economic growth between 2010 and 2015 was much stronger than the growth in these three countries. However, the difference between the growth rate in Turkey and the growth rates in these three countries has decreased. The IMF forecasts that the Turkish economy will see 2018 growth in real gross domestic product (GDP) that is roughly in line with that of Poland, Hungary and Bulgaria. Nonetheless, this growth is to be considered a success. After the political unrest in the summer of 2016 and the reaction by the Turkish government to it, an economic downturn could not be ruled out. Why did the Turkish economy develop so positively? An increase in government spending and tax cuts: Higher government spending increases the demand for goods and services. When companies adapt to this demand, they increase their production. GDP grows as a result. Tax cuts increase the disposable income of consumers and stimulate consumption demand as a result. In addition, tax cuts increase the return on investment. This also causes the demand for investments to rise. Government loan subsidies and guarantees: Government support for lending stimulates demand for goods and services even more. Devaluation of the Turkish lira: The Turkish currency has come under considerable pressure in recent years. 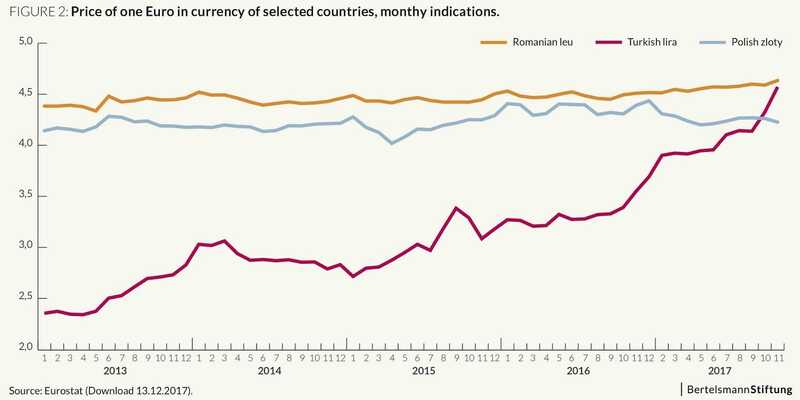 For example, while the Polish and Romanian currencies more or less did not lose value relative to the euro between 2013 and 2017, the value of the Turkish lira halved: In January 2013 one euro cost 2.35 lira. In November 2017, by contrast, it was necessary to pay almost 4.60 lira for one euro (see Fig. 2). This devaluation makes Turkish products cheaper in the rest of the world. And Turkey’s exports are rising as a result. 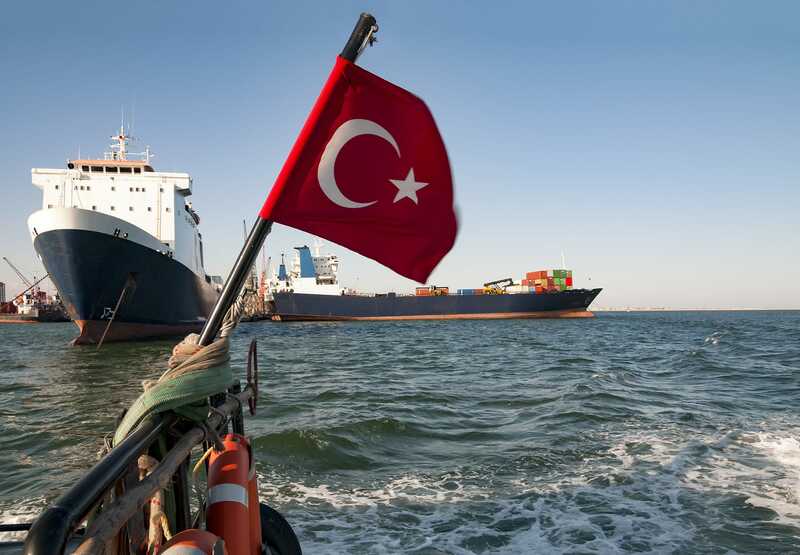 The higher sales revenue from exports by Turkish companies will also increase growth. At the same time, however, it should be noted that these three causes are not without side effects. And they even pose a risk to future economic development. Increasing government spending and tax cuts have a negative impact on a government’s finances. 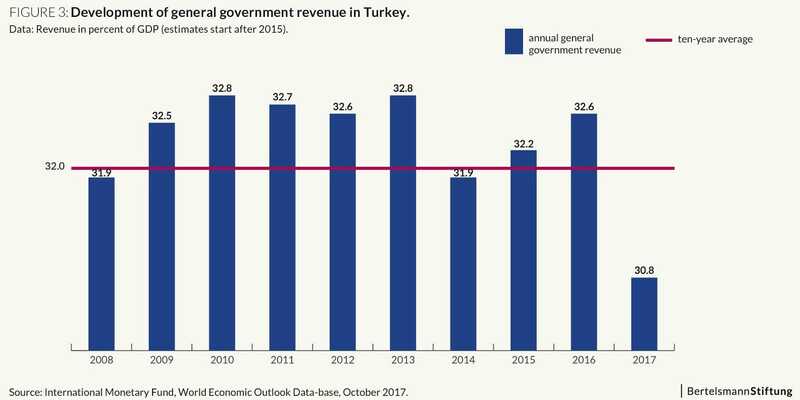 The development of Turkish government revenue shows this with particular clarity: General government revenue accounted for roughly 32.3 percent of GDP on average over the ten year period (2008 to 2017). This figure fell by almost two percentage points to 30.8 percent in 2017 due to the tax cuts (see Fig. 3). In combination with rising government spending, this led to a national deficit of around three percent in 2017. The debt-financed boom will increase the level of debt – both for the Turkish government and the entire economy. An increasing deficit has a negative impact on a country’s credit rating. This makes it more difficult for stakeholders in the business community – the government, companies and private households – to obtain future loans. There is a slowing of the economic growth financed by debt. It is, therefore, not only the IMF’s assumption that economic growth in 2018 will be lower than in 2017 (see Fig. 1). The OECD, for example, also assumes that Turkish real GDP will only grow by 4.9 percent in 2018, while an increase of 6.1 percent is expected for 2017. The greatest economic risk at the moment comes from the weak Turkish currency in my opinion. The Turkish lira lost about 30 percent of its value relative to the euro over the last 12 months (November 2016 to November 2017, see Fig. 2). The consequence of this devaluation is that the prices for goods and services imported from other European countries have increased by around 30 percent. This leads to a high inflation rate. The comparison with Poland, Hungary and Bulgaria shows: While these three countries have succeeded in reducing their inflation rate to around two percent, the current inflation rate in Turkey is around 11 percent (see Fig. 4). 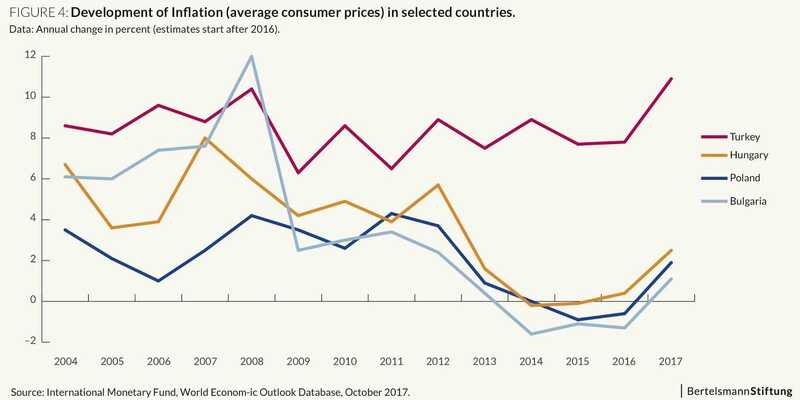 A high inflation rate intensifies the downward trend: Turkish products become less competitive in the rest of the world due to the sharp rises in prices. This has a negative impact on Turkish exports. If foreign consumers no longer buy Turkish products, they also do not need Turkish lira. The declining demand for the Turkish currency will lead to a further devaluation of the lira. This will cause prices in Turkey to increase. And the vicious circle will continue. The existing economic uncertainties are exacerbated by political risks. It is still unclear how economic and political relations between Turkey and the European Union will develop. Such uncertainties have a negative impact on the willingness to invest. A lack of investment means that jobs will not be created and economic growth will slow. Another complicating factor is that foreign investors find it less attractive to invest their money in Turkey. The debt-financed economic boom, however, cannot be sustained without an inflow of foreign capital – whether this is in the form of loans or foreign direct investment. The surge in growth seen in 2017 is primarily due to debt-financed economic growth, which is supported by rising exports as a result of the devaluation. However, both effects will only have a short-term impact. Weaker growth than in 2017 is therefore expected in 2018. The greatest challenges for Turkey’s economic policy, in my opinion, are to fight inflation and stabilize the confidence of companies and investors in the stability of the economic and political system.